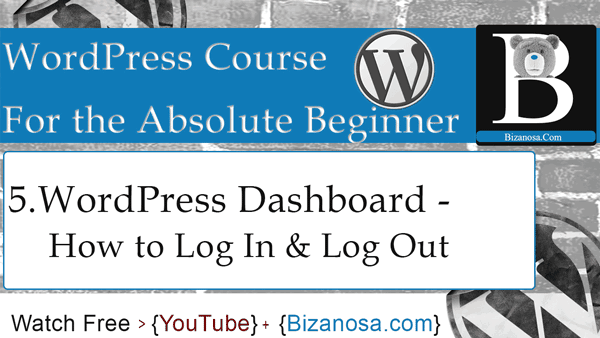 Hi and welcome back to this WordPress course by Bizanosa.Com . So, in the last video we saw an overview of the WordPress dashboard. So these are the links to all the settings, all the features of WordPress. This is where you will get everything. Once you install themes , you will see some of them will add links here. Once you install plugins you will see some of them will add links here. And once you install plugins, there are plugins … Most plugins to access them, you will be able to do so by going to settings and they will be added here. They will add links right here. We have users, we have tools we have plugins .If you want to change the appearance , all of that can be done here . If you want to go to your comments, you want to create a page . Add Media or post. All of that is on this side of the WordPress Dashboard . If you want to log out, you will just come here .And, you can log out. Let’s log out. You are logged out. So let’s say you want to go back to the log in page, you will come to localhost/wpforbeginners/wp-admin. So whatever your website is , if you want to go to the WordPress admin page , you will always go to the link to your website . If your website is at let’s say HughJackman.Com , you can just go to HughJackman.Com/wp-admin and that will take you to the login page. So, to log in, to log out, right there. To edit our profile, right there. This is where our user profile is, you will just come here log out, edit profile . You’ll go here to view your profile . This image is taken from gravatar. From gravatar.com . So you can come here, sign in and your image on Gravatar . The idea is that gravatar will be a way for people to be identified online by an image . So if you are using WordPress, most places if you go to they don’t even need to add a profile picture , you will find the default picture is loaded from the gravatar , from your gravatar . SO add an image there and most places you will be seen by your gravatar. Okay. So in this video we’ve seen how to log in and log out and also taken a look at some of the WordPress dashboard links right here.